Adapted from Cook’s Illustrated (please see note below). 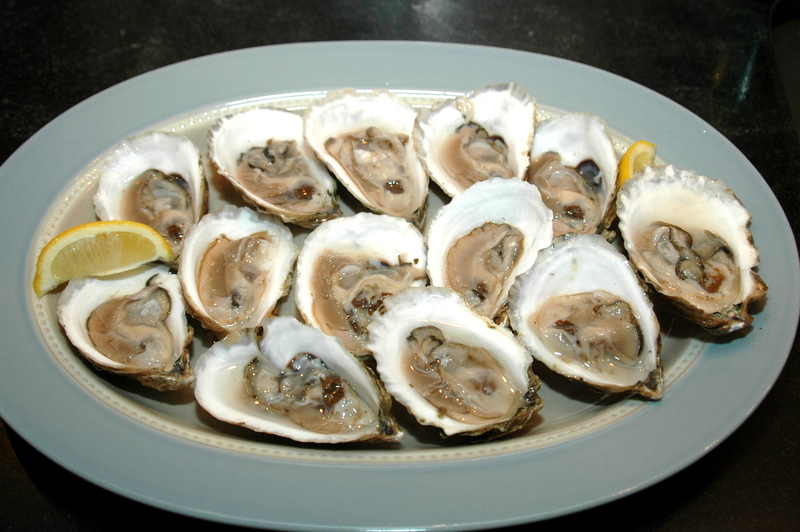 Active involvement-1 hour, cooking time 2&1/2 hours; makes about 16 servings. 1. Place beans, ham bone, bay leaves and water in a 5 qt. pot and bring to a boil over high heat. Reduce heat, cover and simmer on a low boil, until beans are tender about 90 minutes. If too thick, add an additional cup or two of water and continue to simmer until beans are tender. 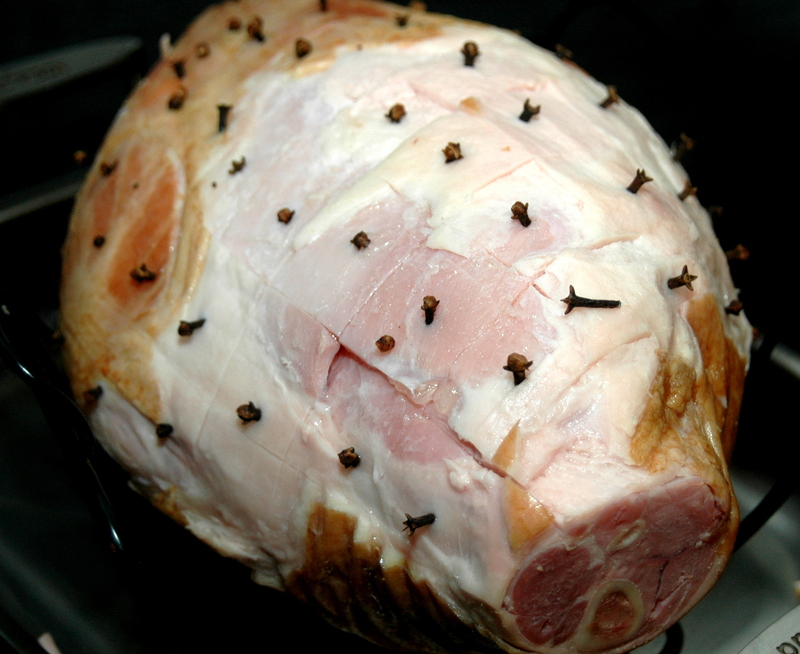 Remove ham bone and bay leaves and discard. 2. In the meantime, heat olive oil in 8-quart stock pot over medium-high heat until shimmering; add the onions, carrots and celery, cook for 6 minutes stirring until vegetables are soft. 3. Add the garlic and cumin and continue cooking, stirring constantly for about 3 minutes. 4. Add the beans and their liquid (after removing and discarding the ham bone and bay leaves), mix well. 5. Add the chicken broth and jalapenos, raise the heat to medium-high and bring to boil, reduce the heat to low, simmer uncovered for 30 minutes, stirring occasionally. 6. Remove 3 cups of beans and 3 cups of liquid to a food processor, process until smooth then return to pot. Add the chorizos and rum bring to a boil, reduce heat to low and simmer uncovered for 30 minutes more. Upon serving add a splash of Amontillado Sherry to each bowl and garnish with chopped fresh cilantro and sour cream. Christmas has come and gone, but the remains of the ham are still with us. Thanks to the kindness of our friend Rita, we found ourselves with a 12 pound Schaller & Weber bone–in smoked ham for Christmas. Originally we had planned on a prime rib roast for Christmas dinner, but the receipt of the unexpected ham necessitated a new game plan. 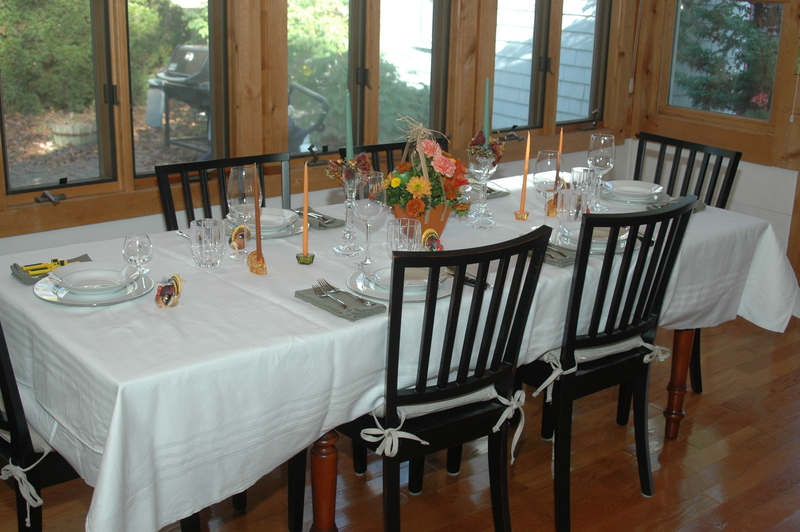 The Roasted Rosemary Potatoes would still work, but the ham, which would be baked with an orange-honey-brown sugar-mustard glaze called out for Dorothea’s Asparagus Tips as the green vegetable, rather than the originally planned Brussel Sprouts Roasted with Hazelnuts. I was assigned ham duty and my wife took on responsibility for the asparagus and potatoes. The ham proved to be delicious and moist, unlike last year’s spiral cut ham, which became dried out as the interior was exposed to too much heat. 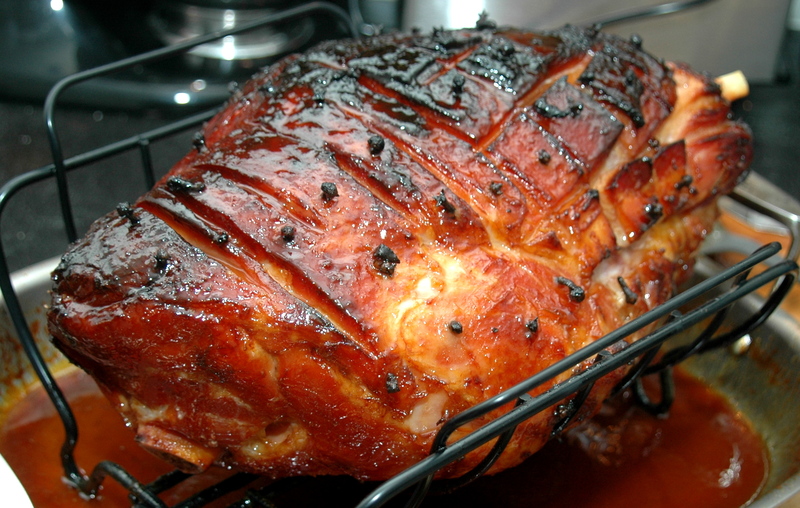 Spiral cut hams are a great convenience, particularly for a buffet where each guest can cut off his or her own portion. But on balance, I think a whole uncut ham is superior in flavor and the carving is not all that difficult. There were only six of us for Christmas dinner, so needless to say there were plenty of leftovers in the ham department. Big Mike always said, the best parts of a smoked ham are the leftovers and the ham bone. He loved frying up the ham for breakfast, which we did in his honor, on two mornings: fried ham and fried eggs the first day and then a ham and cheese omelet a few days later. Then the decision, what to do with the ham bone, which he usually employed in his favorite, Split Pea Soup. But a check of the pantry revealed a 2 pound bag of black beans, and a search of the refrigerator uncovered a package of Spanish Chorizos. 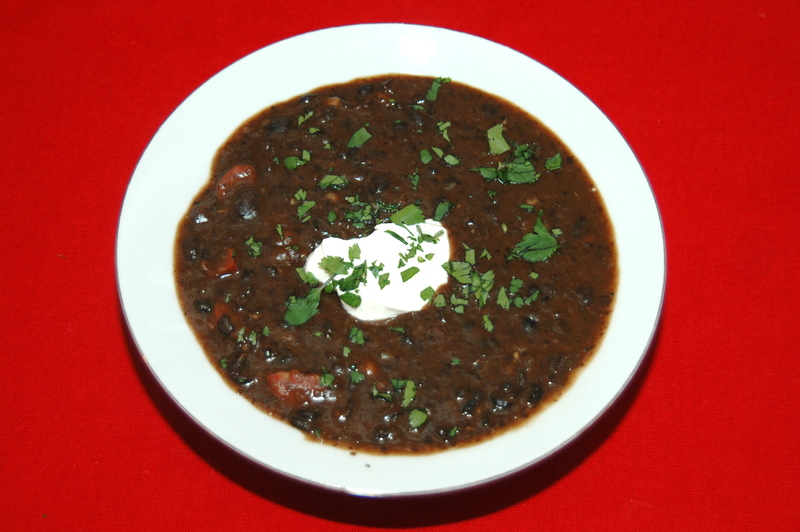 With those ingredients readily available, it was not hard to envision a big batch of Black Bean Soup . After a consulting Cook’s Illustrated.com for the basics on Black Bean Soup, I deleted some ingredients, salt (I figured the ham had plenty of salt), baking soda and cornstarch and added some others, jalapenos, chorizos and rum. I also adapted the proportions of vegetables to my personal taste. Most importantly, I conducted a research of chicken stock at our local supermarket. To my amazement, the quantity of sodium in each brand available on the shelf varied from a low of 150 mg per 240 ml (1 cup) for Kitchen Basics Unsalted Chicken Stock to over 900 mg per 240 ml for the store brand private label. According to Please, Don’t Pass the Salt! Blog, Swanson’s Unsalted Chicken Stock contains 13% lower sodium – 130 mg per cup, but Swanson’s was not available on the supermarket shelf that day. So from the gift of Christmas ham, not only did we have a memorable Christmas dinner but managed to eke out about 6 quarts of soup, breakfast meat for two mornings and still have a half pound of ham leftover for sandwiches. Thanks Rita! 1. Remove the turkey from the refrigerator and packaging about 2 hours before ready to cook. 2. Remove the neck and gizzards from the turkey cavities. 3. Rinse the inside and outside of the turkey and pat it dry. 4. Pre-heat the oven to 450 degrees and position the rack so that there will be a couple of inches above the turkey for the air to circulate. 5. When the oven temperature reaches 450 degrees, stuff both turkey cavities with the stuffing, being careful to not pack it too tight so that the heat circulates inside the cavities. Secure the stuffing in the neck cavity with the skin flap, using two small skewers. 7. 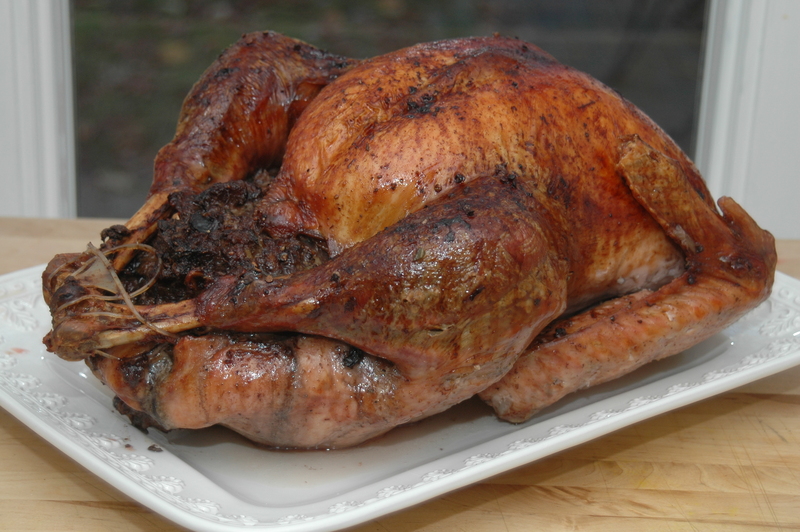 Place the stuffed turkey on a rack in a large roasting pan and place in the oven. 8. Roast at 450 degrees for 20 minutes to seal in the juices. 9. Reduce temperature to 350 degrees and set timer for 1 hour and 40 minutes. 10. 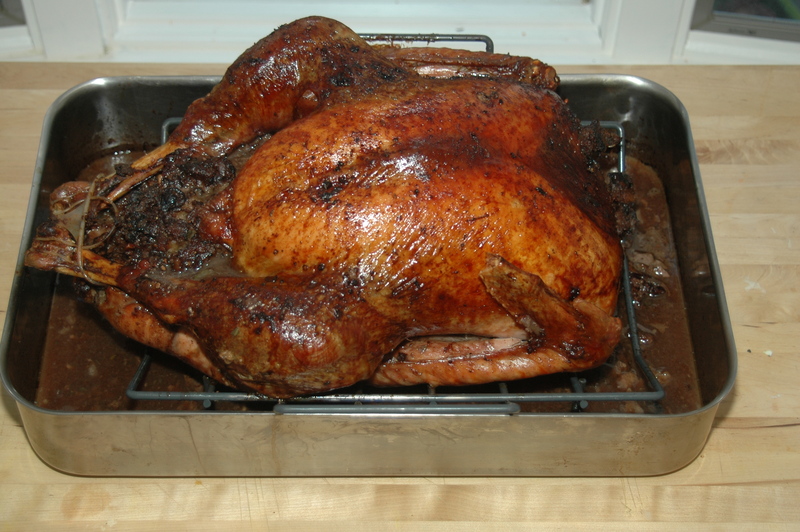 After the two hours in the oven, pour 2 cups of wine over the turkey and rotate the pan 180 degrees. Continue roasting for 1 hour, then pour 2 more cups of red wine over the turkey and reduce oven temperature to 325 degrees. At this point the turkey will have been roasting for 3 hours and should be ready in about another 60 to 90 minutes. So set the timer for 30 minutes and then baste the turkey with the pan drippings every 30 minutes until ready to remove from the oven. 12. Remove the rack from the oven and place it and the turkey on a large platter, cover with aluminum foil and prepare the gravy. 1. Make a broth from the neck and gizzards. Place them in a 3 qt. pot, add 4 large whole shallots, 1 tablespoon of whole peppercorns, 1 teaspoon of kosher salt and cover with water. Bring to a boil and lower heat to a simmer. Cook until reduced to 2 cups. Strain and remove the liquid to a container and wash out the pot. 2. When the turkey has been removed from the roasting pan, strain the drippings into a fat separator. 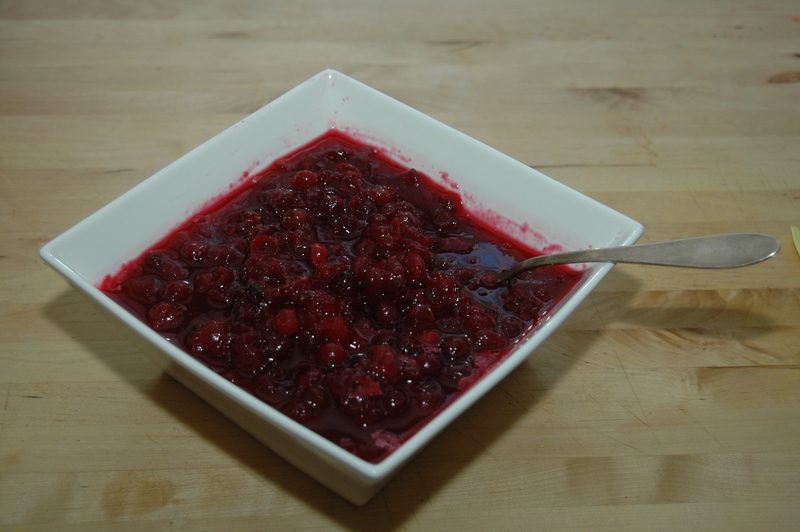 Combine the de-fatted, strained drippings and the 2 cups of broth in the roasting pan. Place the pan across two burners on the stove and bring to a boil add 1cup of red wine and whisk in 3/8 cup of Wondra flour. Stir and boil down to desired thickness. 1. Place all of the ingredients in a 16 qt. pot, cover with water and bring to a boil, reduce heat to medium low and simmer covered for 1 hour. 2. Remove cover and continue simmering for 2 more hours or until the meat falls of the bones. 3. Strain the soup out and discard all of the solids. 4. 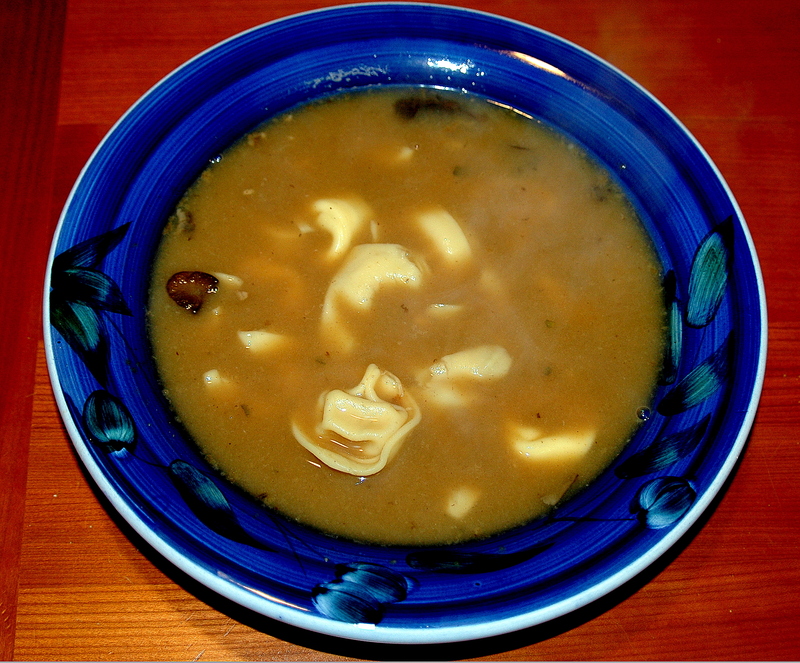 When cooled, place soup in refrigerator overnight. 5. The next morning skim off and discard all of the gelatinous fat that has formed on the top. 6. Heat the soup; add any cut up leftover turkey and gravy. 7. Serve with separately cooked tortelloni, tortellini, ditalini, ditali, elbow macaroni or pastina, whatever is your choice, as well as grated Pecorino – Romano or Parmigiano-Reggiano cheese.